Break in your regular Fantastical Sharing feed for some yogurty goodness! Yogurty is totally a word! Since having Mason, I have been a yogurt-aholic…also a word. Stay with me here, folks. But yogurt by itself isn’t all too filling. I have taken to adding fruit on occasion, but I always add some type of trail mix. My favorite has peanuts, cashews, pumpkin seeds, sunflower seeds, and almonds. Yoplait has come out with a new product that combines Greek yogurt with whole grain oats, flax, and pumpkin seeds for a more filling but still healthy snack: Yoplait Plenti yogurt! Yoplait Plenti yogurt comes in eight flavors including strawberry, black cherry, vanilla, coconut, blueberry, spiced apple, raspberry, and peach. I pretty much ran to my nearest Kroger to pick up some the second I found out about it. My Kroger had black cherry, vanilla, coconut, blueberry, and peach in stock on my first trip. So I picked up one of each. I've never been a big Greek yogurt fan (texture-wise), but decided since I am a loyal Yoplait girl, to give it a shot. Especially since they added in some of my favorite things to make it more filling. This yogurt has seemlessly weaved its way into my morning routine! I wake up, feed and change Mason, and then typically hold him while I check all my computer stuff and sip on my coffee. Yogurt is a fast breakfast for when he lays down for his first nap (fairly soon after he finished his bottle) and I have the chance to pump. I can eat it one-handed and, even though it only takes me a matter of minutes to eat, I'm filled up until lunch. 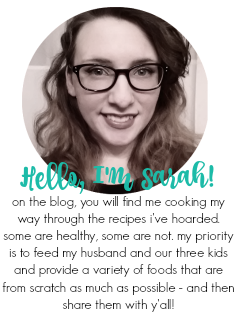 When I was eating a bowl of cereal or a granola bar, I would be hungry in an hour or so - not even getting close to lunchtime. It also makes for a great midday snack or late night snack. I am often up at 2 or 3 am to pump and I get so hungry. I don't feel guilty at all grabbing a cup of Greek yogurt packed with goodness to eat while I'm up. Perfect brain food for crunching numbers for my budget too! To date, I have tried all the five I have purchased. I think my favorite of those five flavors is a tie between black cherry and peach (which surprised me). I am a strawberry or strawberry banana yogurt fan. They are my go-to flavors. I actually really don't like peach yogurt at all, but this Plenti peach yogurt is incredible. You get little bits of peach - which is my FAVORITE part! And I really like that it's Greek yogurt without the texture of the typical Greek yogurt. WE BELIEVE MORE IS MORE. OUR PURPOSE IS TO ADD MORE GOOD STUFF TO LIFE. 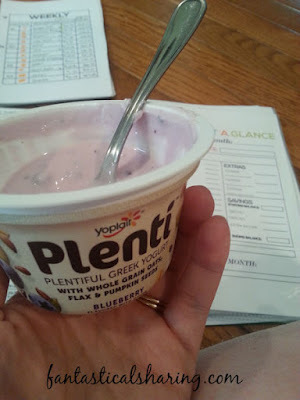 Many thanks to Plenti for sponsoring today’s story and encouraging me to a whole new side of yogurt!